World Famous Pro-Gold Grease from Pro-Shot is used and sought after worldwide by accuracy minded shooters! This product is an easy to use and apply Syringe of Pro-Gold. A special superior formula grease engineered for firearm lubrication and protection. Superior performance on stainless, chrome molly, nickel, and blued firearms. World Famous Pro-Gold Grease from Pro-Shot is used and sought after worldwide by accuracy minded shooters! 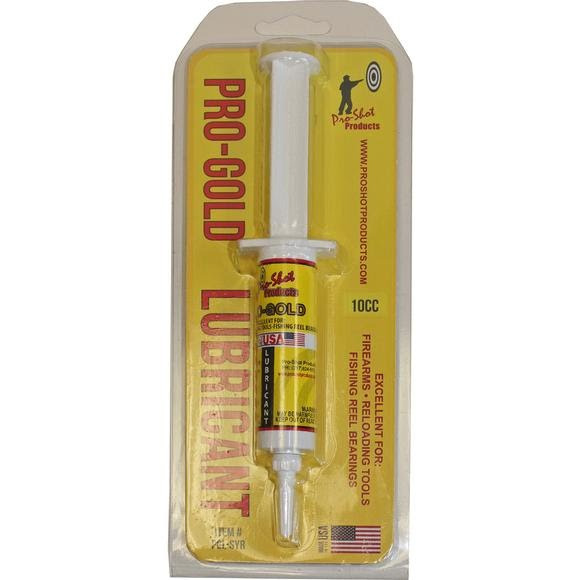 This product is an easy to use and apply Syringe of Pro-Gold. A special superior formula grease engineered for firearm lubrication and protection. Superior performance on stainless, chrome molly, nickel, and blued firearms. Prevents metal wear areas: bolt action locking lugs, actions, frame rails, shotgun hinge pins, and reloading tools.